Award-winning and critically acclaimed historian Helen Rappaport turns to the tragic story of the daughters of the last Tsar of all the Russias, slaughtered with their parents at Ekaterinburg. Much has been written about Nicholas II, his wife Alexandra and their tragic fate, as it has about the Russian Revolutions of 1917, but little attention has been paid to the Romanov princesses, who – perhaps inevitably – have been seen as minor players in the drama. 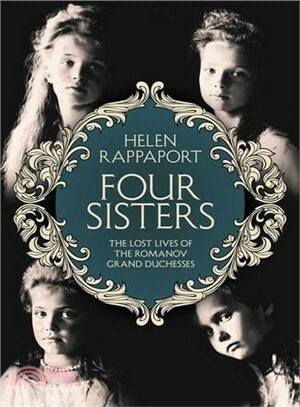 In Four Sisters, however, acclaimed biographer Helen Rappaport puts them centre stage and offers readers the most authoritative account yet of the Grand Duchesses Olga, Tatiana, Maria and Anastasia. Drawing on their own letters and diaries and other hitherto unexamined primary sources, she paints a vivid picture of their lives in the dying days of the Romanov dynasty. We see, almost for the first time, their journey from a childhood of enormous privilege, throughout which they led a very sheltered and largely simple life, to young womanhood – their first romantic crushes, their hopes and dreams, the difficulty of coping with a mother who was a chronic invalid and a haeomophiliac brother, and, latterly, the trauma of the revolution and its terrible consequences.